basic guidelines apply when planning Japanese landscaping. The Japanese style of landscaping has the goal of recreating the serenity of a natural environment. Fundamental ingredients used include carefully placed stone, statuary, bonsai, and fish ponds. Bonsai is a traditional technique of training small trees to encourage their growth into certain shapes; it is one of the Japanese arts. Relaxing strolls through the garden are laid out with formal paths. A number of basic guidelines apply when planning Japanese landscaping. The first being that plants and other elements not be located symmetrically. Nature is asymmetrical. Flowers and trees don’t naturally grow lined up in rows or in square formations. The impression to aim for is a space that does not look man-made. Another guideline of Japanese landscaping is that it must not be crowded. Because yards can be small, sometimes people want to fit in as many plants as possible. This can easily end up looking chaotic and messy. Just like with the Japanese sense of interior decorating, a minimum of plants cleverly arranged can generate an innate harmony of visual calm. A roughly triangular pattern appears commonly in Japanese landscaping. 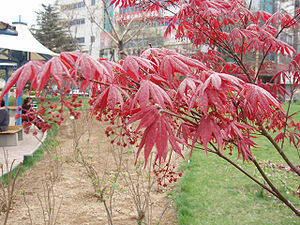 For example, there are three plants you want to plant, the largest is located first as an anchor point of the triangle. The next largest becomes the second point on the triangle, and the third largest plant the other point. This arrangement helps balance the aesthetic mass of the three elements. Symbolic meanings are associated with plants and other elements used in Japanese landscaping. Deciduous trees, for example, like the colorful Japanese maple, stand for the change that is constant all through life, since they show a different aspect of themselves every season. On the other hand, evergreen trees stand firm and stable. In order for something always to be in bloom in the garden, flowers are often planted that will bloom sequentially. The colors seen in a Japanese landscape garden tend to be pastel and subtle. In fact, subtle is a good word to keep in mind when planning out your Japanese landscape garden. MAKE YOUR DREAM COME TRUE !! !